Since it began in 2013, the Premier League Girls Football programme has given thousands of girls the chance to try out the game. But there is more to the initiative than playing. Clubs also offer a pathway for those who want to move into coaching, an opportunity taken by Sarah, 18, and Jess, 17 from London who only really started playing the sport three years ago. 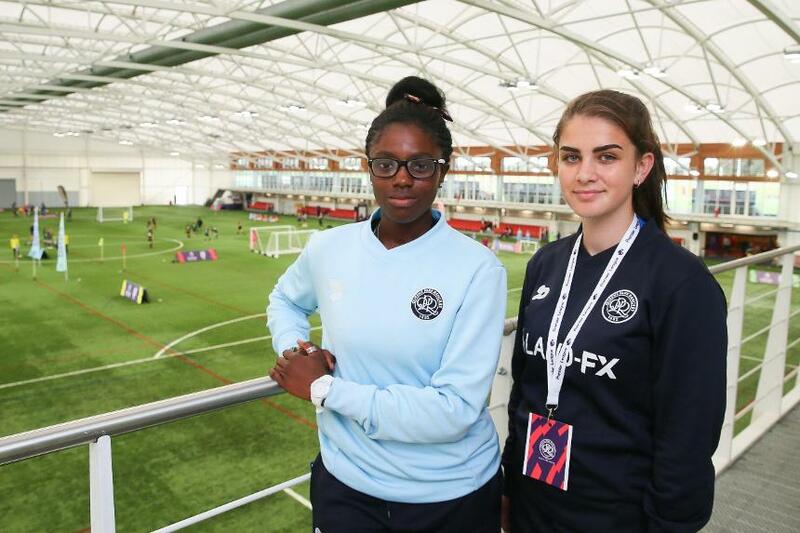 The pair are now qualified coaches with QPR in the Community Trust and last week they took girls from their programme to St George's Park for the Premier League Girls Football National Festival. Jess: I wanted to get involved because all the boys were playing and there was not much opportunity for the girls. Jess: I didn't really know about girls football at the time. There wasn't anything around. There was the school team but that wasn't really taking off. Sarah: There were 10 girls at the first session I went to but it was great fun and it made me want to come back. I have been there ever since. Jess: That first session was really nerve-wracking but I have come away with many friends now, it's amazing. Going along to the sessions really encourages you, it's a place where you can take your mind off things, allows you to just kick a ball about and not have to worry about anything else. Sarah: I saw how our coach Kerry inspires people and how he does things, that’s what encouraged me to get into coaching. Jess: I have always wanted to do something in sports and since my coach always inspired me, I thought, why not do the same for younger girls? Sarah: We got our FA Level One coaching qualifications last year and hopefully I will do my Level 2 soon. I want to carry on coaching. I hope to get more girls into football. Jess: To get that qualification means a lot. It's what I do every week. I never would have thought that I would be a qualified coach. I am proud of myself and I hope that I can make other girls feel the same way, that they want to follow us. Sarah: This programme means everything to me. It's kept me out of my house every week instead of sitting down and watching TV. It's given me friends, a family, a job and something to look forward to. It's made me more ambitious to try to strive for my goals. Jess: Coming here to St George's Park is incredible. I wish we could have played at something like this. It's amazing here. It really inspires the girls and makes them think, 'why I couldn't be here in 10 years training and playing for England? Why not me?'. Sarah and Jess coach in Shepherd's Bush every week for QPR in the Community Trust, who engage nearly 300 girls in PL Girls Football every week. QPR are one of 86 clubs that deliver the PL Girls Football programme, run in partnership with The FA, with more than 45,000 taking part over the last four years.